What Does Your Bathroom Décor Say About Your Restaurant? Empty toilet paper dispensers, broken partition doors and jammed paper towel distributors are a restaurant patron’s worst nightmare. As an owner, your goal is to make your restroom feel like a temporary retreat. From touching up makeup to snapping a mirror selfie, women spend twice as long in a public restroom as men. With that in mind, it’s important that yours makes a good impression. We spoke to The National Restaurant Consultants, VONN Lighting, Niagara Conservation and the U.S. Green Building Council to find out how to design a restaurant bathroom that will impress your guests. First and foremost, your restaurant bathroom needs to be clean and presentable at all times. A dirty restroom can give guests an unsavory image of the kitchen and other areas of your establishment. Automatic air fresheners and nicely scented cleaning products make a big difference, too. Make sure the floor is clean. 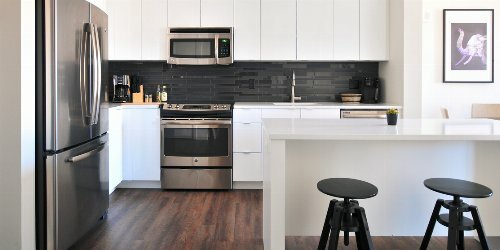 Wipe down countertops and faucets. Repair or block off any broken toilets. Restock paper products, soap dispensers, etc. Empty trash cans and take bags to your restaurant dumpster. Pro-Tip: Although it may seem like a no-brainer, displaying an “Employees must wash hands before returning to work” sign shows guests that you’ve trained your staff to make cleanliness a priority. If your dining space is painted in warm and inviting hues, entering a stark white bathroom can be off-putting for guests. Make sure your bathroom complements the rest of your décor to make your guests feel at-home throughout their experience. Ever thought about how many germs are looming on the soap dispenser? Puts a bad taste in your mouth, doesn’t it? 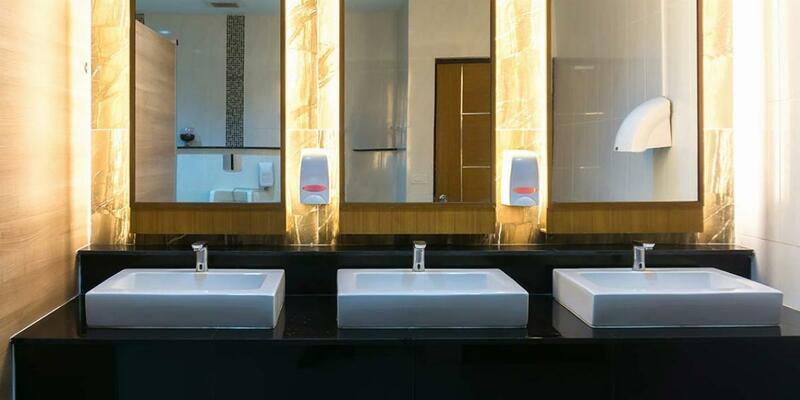 Minimize the number of surfaces patrons need to touch by installing hands-free faucets, soap dispensers and hand drying stations. Privacy is key to making your guests feel comfortable in your restroom. Make sure all locks latch completely. Choose stall doors that minimize sightlines and install adequate partitions for urinals. Some restaurants even use wooden doors for each stall to create a truly individual space. When guests have trouble flushing, it leaves the next patron with a bad experience. Installing toilets with a strong flush, large water spot and elongated bowl will help keep a clean appearance. When replacing toilets, consider a water-efficient model to cut your water bill and help the environment. Most restaurant restrooms don’t have windows, so lighting makes all the difference. To save money on electric bills, consider switching to LED lighting. Taking extra steps to minimize energy use will not only help boost your eco-friendly image, but keep money in your pocket. Your guests spend more time looking into your bathroom mirrors than you think, whether they’re sprucing up for a first date or an anniversary dinner. Hang large mirrors to make the bathroom mirror-check enjoyable. This can also help a small restaurant bathroom appear larger. Bonus points if you hang a full-length mirror. When working with an architect or designer, you’ll want to design your restaurant to fit as many seats as possible. At times, this can limit the amount of bathroom space available. Make sure to work with a builder that is familiar with occupancy regulations and compliance issues related to the number of toilets per regular occupant in your area. These factors are especially important for new construction. From cell phones and wallets to purses and jackets, your guests have their hands full – and nobody wants to set their stuff on the restroom floor. A few installations can make your restaurant bathroom more convenient. Hooks on the inside of stall doors make it easy for guests to hang belongings and flat toilet paper roll holders can act as stands for cell phones and wallets. More importantly, make sure your commercial restroom complies with ADA requirements. Generally, a single wheelchair must be able to rotate within your bathroom and at least one stall should be handicap-accessible with a grab bar. Guests notice when you’re running an eco-friendly restaurant. From composting paper towels to installing hand dryers, there are many steps you can take to make your restroom less wasteful. Consider using the TRUE Rating System from the U.S. Green Building Council, which aims to reduce your carbon footprint, support public health and encourage a zero-waste economy. You can even take it a step further and become LEED certified. Ready to Design Your Restaurant Bathroom? Finding creative ways to appeal to diners will keep your restaurant growing. Not only will you satisfy current guests, but many of these sustainable switches can help attract new customers and even cut costs down the line. If you’re looking for more maintenance checklists and restaurant renovation tips, check out the Commercial section of our blog. Plan these DIY landlord projects and rental property maintenance projects that yield high ROI on rental property. Are You Running an Environmentally Friendly Restaurant? From locally sourced food to biodegradable utensils, restaurants across the country are adapting to sustainability trends. 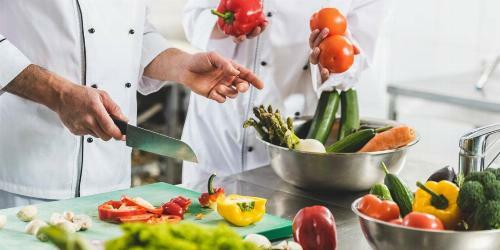 Learn which green practices you can incorporate into your restaurant’s daily processes to serve up an eco-friendly dining experience.